We had a super fun storytime this week! The kids had such positive energy and everything went smoothly. 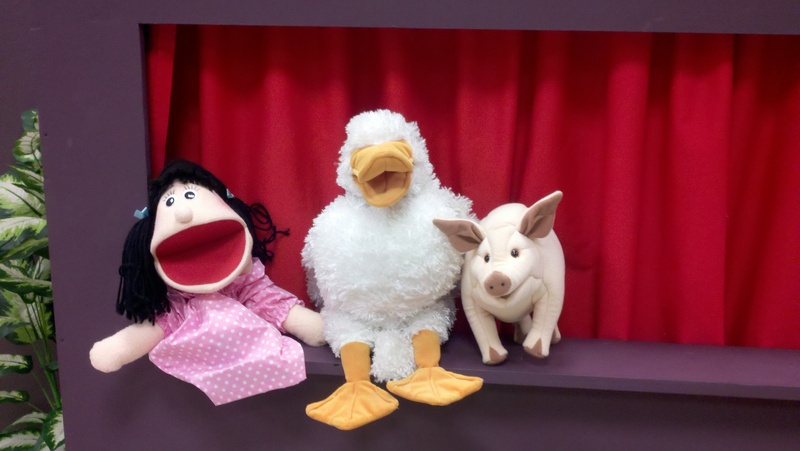 Also, Quacky was very happy to be joined by some of his friends from the puppet shelf! In this story, a farmer tries to wash his pigs, only to find out that mudbaths are quite fun! It’s a cute story with a nice rhyme, and it taught the kids in my Tuesday session a new word: Hogs. A big thank you to Melissa for the dirty/clean pigs template! I’ve been super busy lately and didn’t have time to make something out of felt, so printing these babies out was a lifesaver! I had the kids stand up for this one, and when we got to the part about jumping into the mud, we all jumped! Then we clapped on the ‘landed with a big thud’ part! The kids really seemed to enjoy this one. Even the toddlers were participating (kinda)! I got this idea from So Tomorrow, who got it from Jan Irving and Robin Currie’s book: Straw Into Gold: Books and Activities About Folktales. 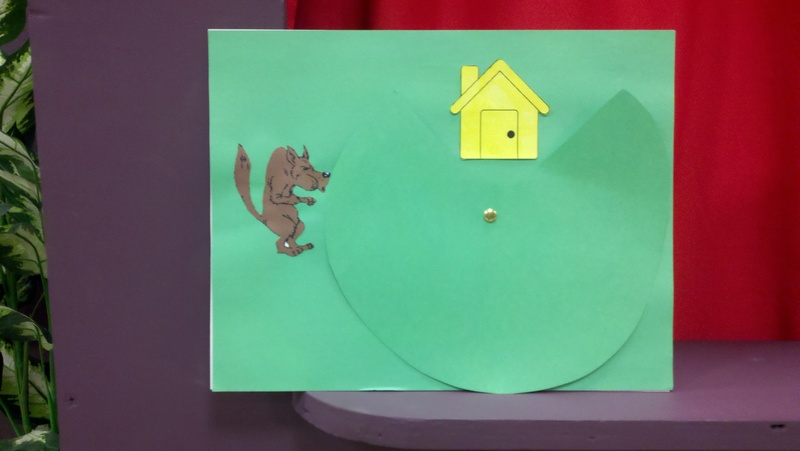 Basically, you tell the story of the Three Little Pigs while spinning a circle to reveal each house. I normally don’t do voices very often, but I did a big, bag wolf voice and a little pig voice for this one. 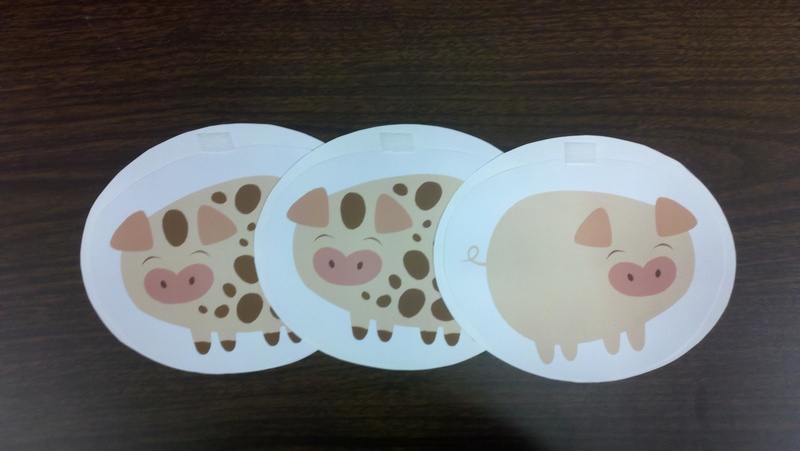 The kids laughed at my piggy voice, which I take as a compliment! 🙂 I also had the kids help the big, bad wolf blow the houses down. One little girl in my Tuesday session took this job very seriously; it sounded as though she was getting as much air into her lungs as she possibly could! 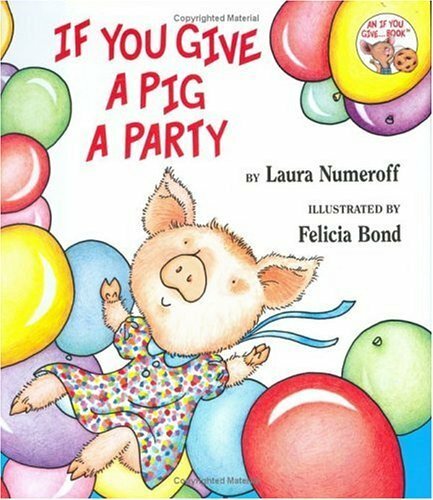 If you give a pig a party…you’re in for a fun-filled day! These books work so well with storytime; however, I still love If You Give a Mouse a Cookie the best! Woo hoo! Glad to help!